Labyrinth Books in Princeton will be hosting Saturday Story Time for children this Saturday, June 20, at 11:30 am. This week's selections will include The Story of Ferdinand by Munro Leaf and You? by Vladimir Radunsky. Readers of all ages are welcome, but especially those 5 and under. 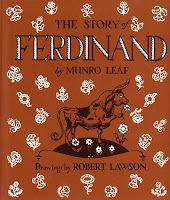 The Story of Ferdinand, written by Munro Leaf and illustrated by Robert Lawson, is one of the best-loved children's books of all time. It tells the story of a little bull in Spain, who would rather sit under his favorite cork tree in the pasture and smell flowers than fight in bullfights. You? 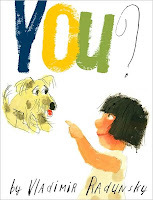 by Vladimir Radunsky is the story of a little girl in a polka dot dress with brown spots and a little white mutt with brown spots each looking for someone to love. Labyrinth Books, an independent bookstore, is located at 122 Nassau Street. It has an extensive children's section run by Bobbie Fishman, who is extremely knowledgeable and always ready to help with new titles and classics. Whether or not you can make it to Saturday Story Time, check out this great place for children's books the next time you're in town.